Freek Out: Both mindWave (pictured here) and mindFreek use low-frequency sound to alter your brainwaves. Can you really get stoned through your ears? There’s little, if any, scientific evidence to back it up, but proponents of binaural beats (sometimes called binaural tones) claim that bombarding the brain with precisely timed bursts of low-frequency sound can produce all sorts of transformative effects—from a mellow buzz to a wired euphoria. The belief is that the pulsating sounds, when administered through stereo headphones, can alter brainwaves, producing specific benefits. The use of binaural beats goes beyond cyber-tripping. There are specially configured binaural concoctions for relaxation, inducing sleep, enhancing creativity, and even for help with headaches and weight loss. The concept has been kicked around for decades. The proliferation of portable music players provides a cheap and easy way to peddle the notion to young people. With mindWave and mindFreek, Jakub Koter has attempted to harness the alleged power and potency of binaural beats via the iPhone and iPod touch. Some of the sounds resemble New Age ambient music heard through a window fan; others are more like running water, rushing air, or perhaps a rooftop air conditioning unit positioned maddeningly close to your hotel room window. A timer in each app lets you pre-measure the length of your dosages in minutes. mindWave also includes a “Visual Stimulation” screen that simply flashes white at varying intervals. The developer does not provide any documentation explaining the proper use, or even the point, of this feature. Not surprisingly, repeated attempts to get mindWave and mindFreek to produce their implied results were fruitless, but that doesn’t mean the apps have no practical value. Many of the tracks work well as pleasing white noise, which for some people can be helpful in maintaining concentration on a task. This review was written to the beat of mindWave’s “Coffee” stream. 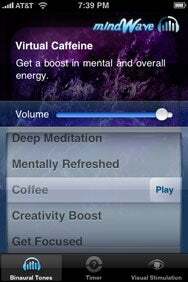 The apps’ binaural tones probably won’t convert you into some sort of 21st century Timothy Leary, but they can be used with some effectiveness if you’re looking for a different way to relax, meditate, or just seclude yourself from the noisy chattering of your coworkers. mindWave and mindFreek are compatible with any iPhone or iPod touch running iPhone 2.2 software.